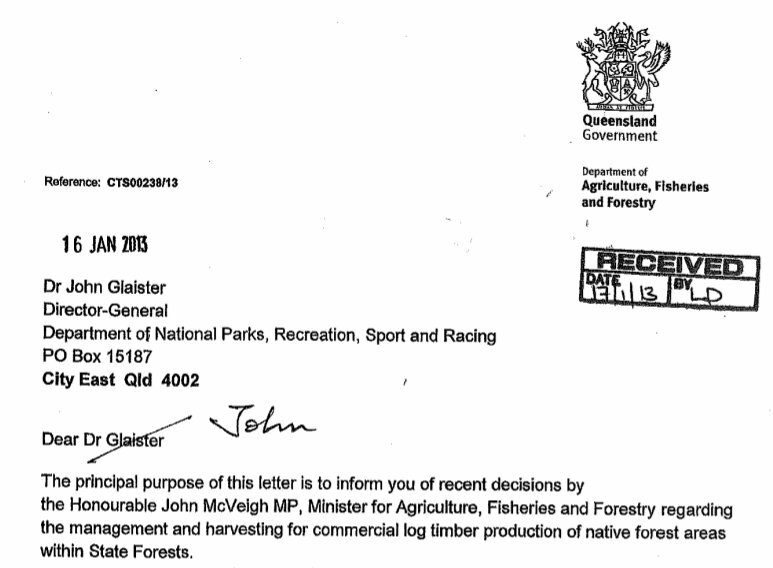 "Minister McVeigh has approved that the areas of State Forests previously excluded from further harvesting by the former State Government, as well as the State Forest areas proposed for tenure transfer to the protected areas estate, are now available for commercial log timber production and associated harvesting once again. This includes the State Forest areas within the 1.2 million hectares identified in the Western Hardwoods and Cypress Regions for proposed inclusion in the protected area estate and the remaining State Forest areas in central Queensland, the Mackay-Proserpine area and the north Queensland ecotone forests." Logging of the state's cypress forests in southern and central Queensland has been authorised with sales permits being offered to the 14 eligible cypress sawmillers valid for the period 1 January 2013 to 31 December 2037. 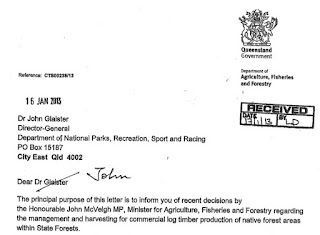 The memo also suggests that the Queensland Parks and Wildlife Service (QPWS) not have any authority to approve 'Code compliant operational harvest plans'. I guess they are worried the wildlife ecologists might ask for too many stringent conditions, like protecting some biodiversity for future generations. The Queensland Parks Service has effectively been relegated to a bystander role, with the Strategic Harvesting Plan for each region listing the individual areas scheduled for harvesting and destruction to be delivered to QPWS regional personnel so they understand to stay out of the way. Greens Senator for Queensland Larissa waters accused the conservative Queensland Premier Campbell Newman of being an environmental vandal determined to slash all protection for Qld's environment in a media release. "Premier Newman is ripping up the agreement between industry and environment groups forged over decades to protect our remaining native forests and has already offered 25-year sales permits to 14 cypress sawmills," Queensland Senator Larissa Waters, the Greens environment spokesperson, said. "The re-opening of native forest logging will trash invaluable habitat for native wildlife, destroy carbon stores, and is an economic risk given plantation forestry is a more sustainable and provides reliable employment into the future." "This is devastating news and confirms Campbell Newman is an environmental vandal." "Nowhere is safe from the Newman Government's program of environmental destruction." "Premier Newman is determined to repeal every last environmental protection in Queensland. Already protections for our native vegetation, wild rivers, coastal areas and land subject to development have or will be slashed and shale oil and uranium mining is back on the agenda." "The Newman Government does not understand that a healthy economy requires a healthy environment, and he is turning his back on all Queenslanders who love our natural environment and whose jobs rely on our Reef, our beautiful natural areas and our iconic species," Senator Waters said. The 1999 Regional Forest Agreement negotiated the timber industry leaving state owned forests over a 25 year period and converting to using hardwood plantation timber. It was hailed by loggers and conservationists as a landmark agreement. In 2006 the Queensland timber industry put forward a plan to end logging in native forests and move to 100% plantation timbers. Timber plantations would be increased by 50 per cent. "The reality is that cutting down 100-year-old trees won't continue and we've got to gear businesses to process plantation-grown material," said Queensland Timber chief executive Rod McInnes. "Our future is in plantations and on private land." according to a Courier Mail 2006 report. This plan was welcomed by Rainforest Conservation Society president Dr Aila Keto who said "It recognises the importance of protecting biodiversity, old growth forests, areas of high conservation value and alleviating impacts of climate change,"
So by December 2012 the logging industry wanted access again to native forests managed in state parks. With a Liberal National Party in power and a sympathetic Minister, native forests and their unique ecologies and biodiversity are again under threat. In foreshadowing this change, Forestry Minister John McVeigh told the ABC in December 2012 "We believe there is in the order of 100,000 hectares of forest that can be accessed on quite a sustainable basis," he said. "We have also got the Western Forest and we are working on 25-year access agreements for cypress for our struggling timber industry." Forget the carbon sink and biodiversity values of these forests, as well as the numerous natural ecological services they provide such as filtering our water supply and playing a flood mitigation role - supporting the jobs in the logging industry over the short term is deemed far more important than these ecological services which are delivered over the long term and which we all benefit from.